There have been many solutions to the weed problem over the centuries; the Romans believed that if the weeds were uprooted in the fourth quarter of the moon, then they would not return. In the thirteenth century, preparation of a planting area involved the use of boiling water to kill the weeds. Dandelions were severed one inch below the surface and a teaspoonful of salt placed on the cut root. The Victorian philosophy was that it was a moral duty to remove the evil of weeds; also the vapour from cultivated earth was thought to be good for health, and that kneeling close to it while weeding was beneficial. Until the widespread use of weedkillers became the normal method of clearing land for planting, foraging animals such as pigs were penned in the area and as they turned over the soil most of the deep-rooted plants were removed. They are very useful in woodland as they remove the brambles and other scrubby growth, but do not damage the trees. Some conservation organizations are returning to this method to recover and maintain larger areas. Recognizing the growth habits of the weeds is important if the process is to be successful. Perennial weeds can regrow, usually from fleshy roots or underground stems. For example, simply pulling the topgrowth of a Dandelion up leaves the deep taproot to sprout again. Also, although the many species of Willowherb look similar they have different root systems; Broad-leaved Willowherb is relatively easily uprooted, but Rosebay Willowherb has an extensive network of rhizomes. Although it is great to know the name of the plant that is being a nuisance, it is not essential when it comes to eliminate it. By observing its growth habit and means of spreading you can devise the correct strategy. When using cultural methods it is important in most cases to uproot all of it and not to "graze " the topgrowth, otherwise it will soon re-grow. If it has fine fibrous roots and is a single plant or clump, then uprooting it should work. A large clump may have stems which creep over the surface and growth points with fibrous roots along their length so uprooting all of these will remove it. The most difficult to eliminate are where there are underground creeping roots which produce topgrowth at intervals, these must be teased out. A mature stand of Ground-elder , Bindweed or Couch Grass will have a dense network of these rhizomes so they are difficult to remove completely by cultivation methods. Most will probably have germinated from a bank of seeds in the soil or blown in on the wind, so more will germinate and the process will have to be repeated. Removing weeds before they can set seed is also essential. Of course uprooting a weed and leaving it lying there can be a waste of time as there is usually enough sap in the plant to mature any seedheads present which will open and disperse their contents - especially Dandelion, Bittercress or Willowherbs. For perennial weeds with deep or widespread roots, a systemic weedkiller such as Glyphosate may be required, this will be taken down into the roots and kills the weed in about 7 to 10 days. This is particularly helpful for regrowth from fragments of roots left behind and when they are entangled with the roots of shrubs, in hedges or in awkward crevices. If you are opposed to filling the coffers of the multi-national chemical companies and you have the time, then repeated mowing or strimming an area of difficult to remove weeds will eventually eradicate them. This method is not always feasible, eg.in a border, but continually removing as much of the plant as possible will eventually pay off for many weeds, as the energy stored in any remaining roots will run out, so be persistent and don't allow them to grow enough leaves to make more. Dandelion, Daisy, Pearlwort, Plantain and Creeping Buttercup survive mowing, as they form rosettes at ground level. If you do have an invasive weed in your border, tackle it in the autumn or spring lifting the affected plants and teasing the invader from their roots. Choose a dry period as the soil is easier to shake off. Use a fork when digging as it will tease the roots loose, a spade will chop them up, thus multiplying the problem. For a badly infested border pot up or take cuttings from all of the plants to be retained, being careful not to include weed roots with them, then dig it over to remove the weeds. Allow a few weeks for any surviving roots to regrow and repeat the digging or spray them with a systemic weedkiller. Check the potted plants before returning them to the bed in case some weed roots were missed earlier, and treat. If the area has been weed-infested for some time there will most probably be seeds present, so even after a thorough clean-out of the existing weeds, keep a lookout for new ones. Applying a mulch should prevent most of them germinating. When preparing a piece of ground for cultivation that has a dense covering of weeds or grass, skim off the surface first. Then only the deeper roots will remain and can be removed when it is dug over. The sods which have been removed can be stacked upside-down somewhere out of the way, preferably dark or covered to obscure light, where they will rot down and the soil can be recovered after a year or two. If time allows, covering the area to exclude light for a few months will kill most of the weeds. A porous fabric is best as it allows water and air through and the soil is less likely to become stale. Then any remaining roots can be removed. Hoeing is the best way to keep a frequently cultivated area clear of weeds, such as in the vegetable plot where mulching is not feasible. It should be done on a dry day preferably in sunshine to dry out the disturbed weeds. Use a sharp Dutch hoe or a Swoe with a to-and-fro sliding motion. To be effective and depending on the nature of the soil, you may need to sharpen the cutting edges with a gritstone every 5 to 10 minutes - the sharp tool severs the weeds so they are less likely to take root again. This also leaves a "dry mulch" (a thin layer of dry soil) and helps to conserve moisture. If carried out regularly you should defeat most weeds and the reservoir of seeds in this layer will be exhausted. Uprooted annual and biennial plants can be added to the compost heap provided there are no seedheads on them. The topgrowth of perennials which is free of seed can also be used, in fact young nettle shoots are full of useful nutrients and make ideal material. The roots of perennials should not be used unless they are kept separate first to dry out, or in a plastic bag, until they are dead. Another method is submersing in water for about a month - the result is very smelly, but the liquid can be diluted 1:10 and applied as a fertilizer, and the solids added to the compost. The green waste recycling bin is useful for the unwanted weeds as the processing heaps reach temperatures high enough to destroy the roots and seeds. However Japanese Knotweed should not be placed in the bin - it is also an offence to do so. After cultivating new ground there is always a growth of weeds. It is very important to remove the ephemeral weeds as soon as they appear, as they can flower and produce seed very quickly. If you can, leave the area fallow for a few weeks to allow germination then hoe them or use a knock-down weedkiller such as Paraquat - this works quickly so the weeds don't have time to mature. By the time Glyphosate works they can have produced their seed. REMEMBER - ONE YEAR'S SEED GIVES SEVEN YEARS WEED, as the old saying goes. Of course sometimes the "weeds" are self-inflicted when we plant an invasive cultivated plant, eg. Centaurea montana or Houttuynia cordata. These can be treated as perennial weeds and uprooted or killed off with Glyphosate. 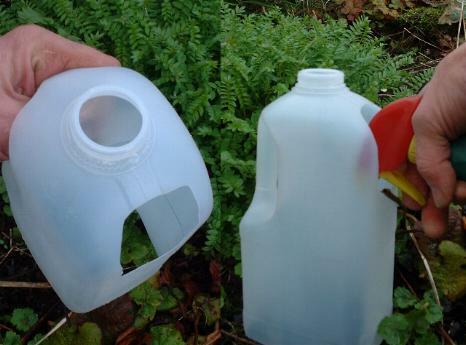 A paint-on version is handiest, but if you have to treat a lot, a spray is quickest - a useful technique is to use a large plastic soft drink bottle, cut off the top and bottom to form a cylinder, or the milk carton shown below with its ready-made handle, then surround the weed with this and spray down onto the encircled plant. For larger clumps use an open-bottomed cardboard box (leave in place until the weedkiller has dried). Choose a calm day for any kind of spraying, following the manufacturers instructions carefully. Some plants are very sensitive to weedkillers and the slightest amount of spray drift will affect them; they may not die, but will suffer some die-back. Alternatively, depending on the ratio of weeds to plants you can protect the plants to be avoided with upturned buckets or boxes, leaving them until the weedkiller dries. Crushing the leaves by hand or stamping on them before application increases the uptake of the herbicide, particularly if they have a waxy surface. Boiling water is still a good solution, especially on paths and along the row where seed is to be sown; other things which produce heat like a steam iron, a wallpaper stripper or a hot-air paint stripper can be used as well. It would take about three attempts at killing the regrowth to work (over about 3 weeks), but it is a good alternative to weedkillers and, if you already possess these items, much cheaper as well. All you need to do is heat the foliage until it wilts - no need to toast it. There are a number of weed burners available on the market, the picture above shows a weed burner which runs on paraffin or heating oil, but there are others which use propane gas. The small 'weed-wands' are only practical for crevices in paving or between plants, but larger versions are available which attach to conventional gas cylinders on a trolley. One advantage of using a flame is that it destroys some of the seed as well, damping down the soil can increase this effect as it conducts the heat deeper down. Gravel paths and driveways with low traffic will always be a seedbed for invaders, especially if they are bordered by an area which contains weeds which are allowed to go to seed. Try to keep such verges tidy and cut down any growth before it seeds. On a commercial scale the biological control of weeds has been tried. This usually involves an insect pest which weakens the weeds and allows the crop plants to outgrow them. In wildlife management grazing animals are sometimes introduced periodically to reduce scrubby plants. A very thick mulch of grass or hedge clippings, or shredded prunings at least 15cm deep, can be applied directly to an out of the way weedy patch such as under a hedge or around trees. Then as some of the perennial weeds make their way to the surface again they can be treated with a weedkiller. This will reduce the amount of weedkiller required. Other materials which will block out the light can be used instead, then it can be removed when all of the weeds have disappeared - old carpet has been used in the past, but it tends to disintegrate and some of the material used in its making can contaminate the soil. Cardboard covered with a mulch can be effective. Finally, when you think you have done the best weeding job ever, go back after a few days for the 'ones that got away' - there are always a few! To end in a pessimistic note, unfortunately it is one of the certainties of life that they will return. Even the thickest mulch will be the perfect medium for wind-blown seeds and those "dropped" by birds - so be vigilant! or use the drop-down menus at the top of the page to find other garden-related information.